PUBLIC NOOSE-ANCE: Twenty five years after forming in Los Angeles, metallic cow-punkers The Hangmen are still delivering gritty, barroom rock-n-roll with a twangy, heartsick twist. HUNG OUT TO DIE: Once signed to a promising major label, the Hangmen have survived the hard way for more than two decades. 'East of Western' is their latest calling card. When it comes to smoke-choked, whiskey-soaked, hard-luck rock-n-roll, few bands do it better than metallic twangers, the Hangmen. Slogging around since 1987 and once signed to the same record label that gave us Guns N’Roses, the Hangmen were left for dead once Geffen Records and the rest of the world started revolving around Axl’s Roses. 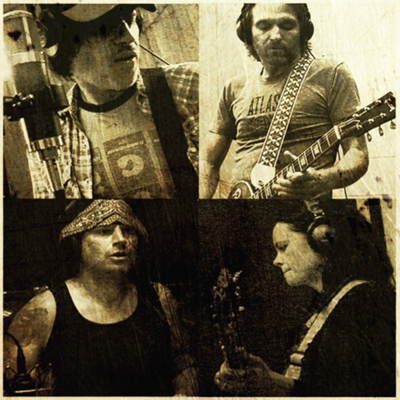 Given enough rope, but refusing to snap after 25 years in a van (with gaps here and there), L.A.’s the Hangmen are back with their latest album, “East of Western” (Acetate Records). 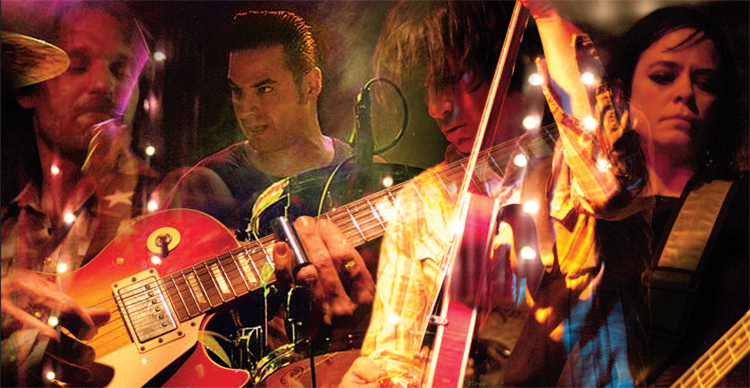 Still fronted by founding singer/guitarist/badass Bryan Small, the latest Hangmen lineup includes longtime bassist Angelique Congleton, returning drummer Dino Guerrero and newly arrived Supersuckers guitarist Ron Heathman. A shot-glass clinker with an outlaw-country aftertaste, “East of Western” opens with an early GN’R-style burner (“Homesick Blues”); downshifts to a mid-tempo loser’s love song (“I’m Your Man”); and then nods off into a downtrodden lament (“Had A Girl”). Elsewhere, the Hangmen deliver an Iggy Pop-ish/“The Passenger”-style guitar chime/chug (“Graverobbers”) and some hobo swing (“Railroad Man”) that – blasphemous as it sounds — echoes John Anderson’s “Seminole Wind.” There’s also a chosen-fate druggie confessional (“Drink Smoke”); some countrified Keith & Mick stagger (“Betrayed”); a spidery voodoo vibe (“Haunted”); and a tribute to late Cramps singer Lux Interior (“Big Red Rooster”). In keeping with tradition, the Hangmen’s latest geeks-only cover is a revved-up twist on the Modern Lovers (“She Cracked”). If old-school Keef and Izzy smacked up the Black Crowes and Tom Petty (and brought along Mr. Brownstone instead of Mary Jane), you’d catch the Hangmen’s latest dusty drift. Call it a batch of Stonesy stupor cut with enough nasal-spewed longing and loathing to make Neil Young and Dylan sound positively cheery. 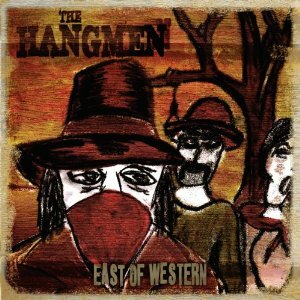 Better yet, call it another great Hangmen record, albeit one that speaks with a more pronounced country accent. Newcomers may be better advised to start with the barn-burning live album, “We’ve Got Blood on the Toes of Our Boots” (it’s a knuckle-busting masterpiece! ), but if the Hangmen already gotcha by the neck, “East of Western” makes a nice distortion-blues stumble served best with hair-of-the-dog … on a rotten Sunday! Sounds great! Will have to check this one out. Thanks for the review! Nice writing, there, Metal Dave. Good review Dave. I really dig this album gotta give it an A. Sometimes ya just wanna pull the shades and drink from a brown paper bag. I would not throw this on at a house party. And it’s not my fav by them, you and I agree the live album is amazing. But I am really enjoying this album.